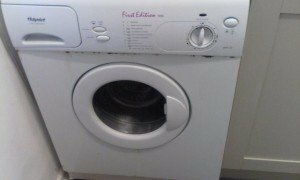 A white Indesit under counter 6kh 1400 spin washing machine. 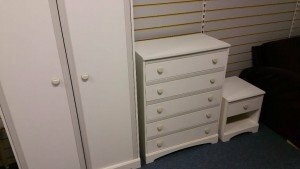 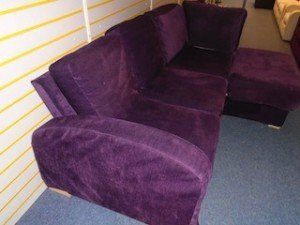 A three piece bedroom furniture suite, includes a tall standing double wardrobe, a chest of five drawers and a one drawer bedside table. 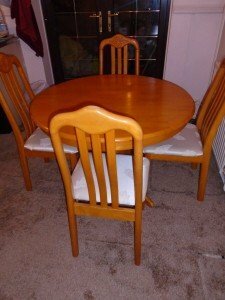 A solid pine circular dining table, together with four matching carved back dining chairs. 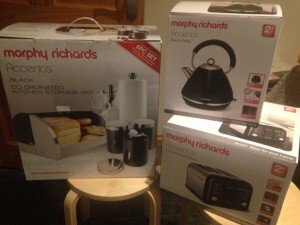 A collection of brand new boxed Morphy Richards black kitchen accessories, to include a kettle, a four slice toaster and an accessory set. 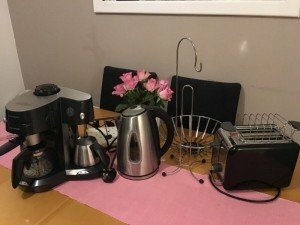 A collection of black and stainless steel kitchen accessories, to include a coffee maker, a kettle, a four slice toaster, a kitchen roll holder and a fruit basket. 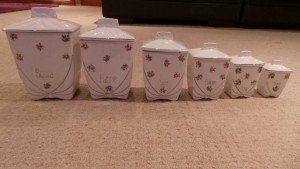 A collection of vintage porcelain kitchen canisters decorated with a floral pattern. 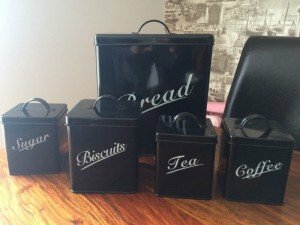 A collection of black and white square kitchen canisters, to include a bread bin, a biscuit tin and tea, coffee and sugar canisters. 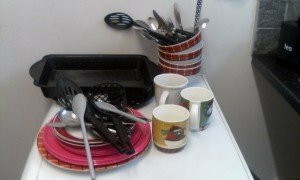 A small collection of kitchen accessories, to include four tartan ware bowls, dinner plates, trays, mugs etc. 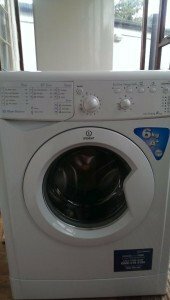 A white Hotpoint under counter 7kg 1400 spin washing machine. 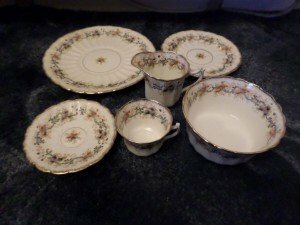 A collection of Royal Albert daisy patterned dinner ware, to include a milk jug, a teacup, two saucers, a bowl and a plate. 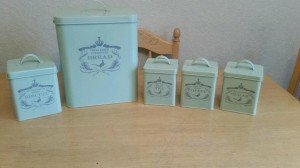 A collection of duck egg blue shabby chic kitchen canisters, to include a bread bin, a biscuit tin and tea, coffee and sugar canisters. 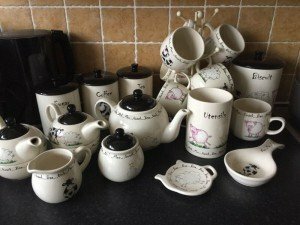 A large collection of ceramic farm animal pattern kitchen accessories, to include tea, coffee and sugar canisters, a lidded sugar bowl, a teabag rest, a utensil pot, two teapots etc. 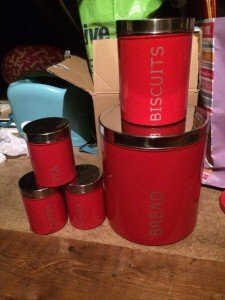 A collection of red and stainless steel cylindrical kitchen canisters, to include a bread bin, a biscuit tin and tea, coffee and sugar canisters. 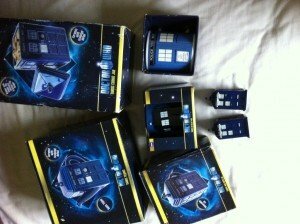 A collection of new boxed doctor who themed kitchen ware, to include a cookie jar, a teapot, three cups and salt and pepper shakers. 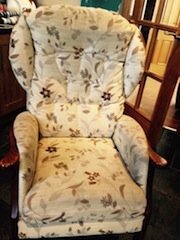 A high back vintage armchair on a solid oak base, upholstered in brown floral patterned cream fabric. 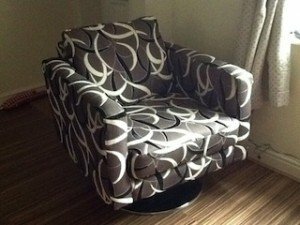 A square low back swivel armchair on a circular stainless steel base, upholstered in black, white and grey patterned fabric. 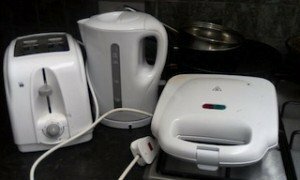 A collection of white small appliances, to include a toast maker, a kettle and a two slice toaster. 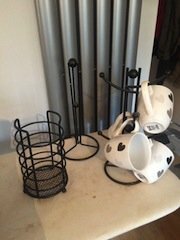 A collection of black and white kitchen accessories, to include three heart patterned cups, a cup holder, a kitchen roll holder and utensil holder. 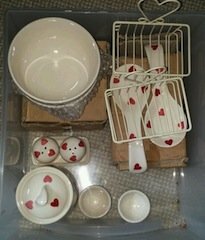 A collection of cream and heart printed kitchen accessories, to include salt and pepper shakers, egg cups, bowls, baskets etc.